Have you heard about text neck syndrome? It’s also been called “tech neck” and is sometimes referred to by doctors as forward head posture (FHP). Well, it’s not just caused by texting. It can affect people who spend a lot of time on mobile devices or computers. Here’s what you need to know about text neck. When we look at the spine anatomy we see that there are natural curvatures to the human spine. 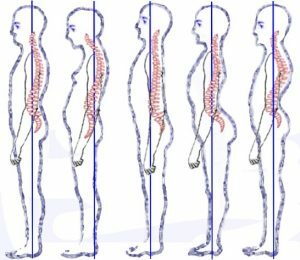 An individual is said to have neutral spine position when the cervical and lumbar regions of their spine curve toward the front of the body and the thoracic portion of the spine curves toward the back of the body. When you view the profile of someone with proper neck posture you’ll also notice that their ears are aligned with their shoulders. In 2014 Dr. Dean Fishman coined the term text neck to describe the poor spine, head and neck posture associated with looking down or forward at a mobile device or computer. 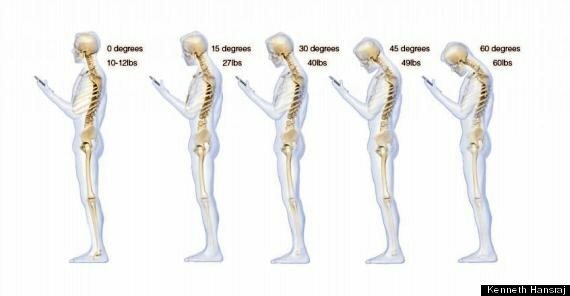 However, the poor posture associated with text neck syndrome doesn’t just occur while the individual is looking down at their device. Studies have shown that after individuals stay in this position for long periods of time, their body doesn’t fully return to proper posture. Instead, their head is angled forward and their ears are no longer aligned with their shoulders. Their spine is no longer in neutral spine position. In the image below the first example shows proper posture. A study by Dr. Kenneth Hansraj showed that forward head posture puts extra stress on the discs, muscles and ligaments of our neck. On average a head weighs about 10-12 pounds. But, as we look down, the pressure on our neck increases. The farther down we look, the more we stress the discs, muscles and ligaments in our cervical spine. The forces felt by our neck make it feel like our head is really 20, 40 or even 60 pounds! Most people that spend time sitting in front of a computer or looking at a mobile device can probably relate to the image above. But so what? Can this forward head posture (FHP) really hurt us? Many studies have shown that it can. According to Dr. Hansraj, the added pressures associated with FHP can lead to tightening of the neck muscles, tears or ruptures of the spinal discs, and spine misalignment. In addition, a deviation from the normal curvature of our spine in our neck can lead to compression of the nerves that lead to our shoulders, arms and hands. In addition, some doctors believe that the poor posture associated with using mobile devices can impact internal organs and lead to respiratory and gastrointestinal issues. With technology becoming more important in our everyday lives how do we fix this problem? Well, hopefully some of the technology companies will help with some ergonomic solutions. In the meantime, pay attention to your posture, don’t stay in one position for too long, do stretches and take frequent breaks.